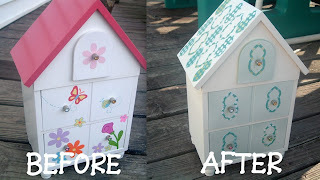 Linkup Now for the Garage Sale Finds and Makeovers Challenge! Course you gotta see the before to appreciate it! Please keep in mind that my middle daughter is 10 going on 40. The kiddie look to the jewelry box would just not work for her. So I upcycled it to make it more for a teen room. First it needed some repairs, so I broke out the wood glue. Then I spray painted the entire piece white. For the top "roof" section, I wanted something unique. This was actually pieces of a free pattern on the Silhouette site many weeks ago. I imported the pattern into my software and deleted all the lines I did not want. Which left me with these really cool shapes. I then cut them out of scrap book paper and broke out the Mod Podge! For the drawers, I spray painted them with a really light green. I actually did not have a green light enough. So after I put the green on, I spray painted a really light coat of white on top until I got the look I wanted. The paint is subtle but gives the piece some interest. I then used some more of those shapes around the drawer knobs. Just look at the little feet on this piece!! Absolutely adorable don’t ya think?? Within a few hours, I had a more grown up jewelry box for my pre-teen! The original box was only $1 at a garage sale. I had the paint and scrap book paper on hand! What a great deal!! A buck for a jewelry box…I will take it!! Now for the side by side shot!! You gotta love those! Y’all stop by my blog anytime for a visit! I would love to have ya! Many thanks to the CSI gals for having me today! I always love guest posting here! And I can’t wait for Thursday for the garage sale makeover link up!! I think it will be full of great ideas! Very cute makeover! I love the shapes you used, Angie. Much more grown up!